Stanhopeas are a highpoint in our summer greenhouse with their wonderfully fragrant large flowers. The flowers last for a few days but while they are out they are magnificent. Stanhopes graveolens is a Central American species. We have seen related species in Costa Rica growing in wet evergreen forest around 1000m. 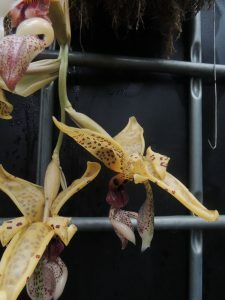 This gives something of a challenge in cultivation as the plants must be in baskets so that the downward growing flower spikes emerge safely but baskets easily dry out especially when hung up high in the roof. 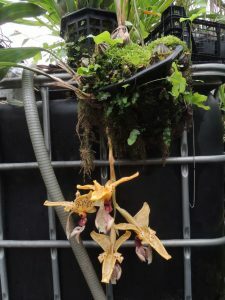 Our solution is to hand the plants relatively low down in the greenhouse – at around bench hight – so that they are well watered and then hang them up higher when they flower so that the flowers are at nose height. The wonderful scents are to attract euglossine bees (as do Gongoras). The males collect the perfume oils from the flowers and then use them in their display to attract females.